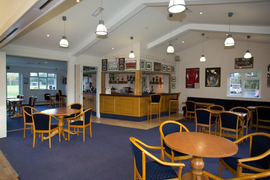 Our recently refurbished hall and bar facility are open to Members and Friends on match days and Friday evenings throughout the season. Spectators are welcome at all matches. There is no admission charge and refreshments are available. In addition to being able to watch a high standard of cricket you will find the pleasant environs of the Old County Ground to be one of the most tranquil and beautiful locations in the Brentwood area. 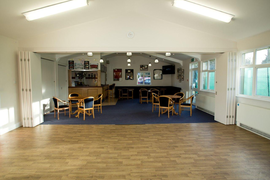 During the cricket season both the ground and/or the hall & bar facilities may be available for private hire provided they are not already being used. Please complete the form below or call Mrs. Patricia ('Pat') Blyth on 07544 381323 for further details. 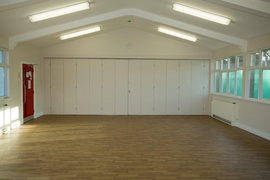 Hall through to Rear Bar (hall partition doors slid aside). Rear Bar through to Front Bar (bar partition doors slid aside).